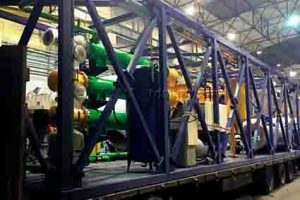 The massive shipment of the equipment for assembling the TDP-2-800 plant (including reactor, condensation unit, and gas line equipment) was sent by IPEC to Messoyakha oil-gas field to be installed on the local MSW and industrial landfill. PJSC Gazprom acted as a Client in this transaction. This pyrolysis plant is designed for processing of oil sludge, frozen oil soaked soil as well as silt from local communal and industrial sewage. The loading unit of the plant equipped with a shredder for shredding branches and stones frozen together with the soil. Since the plant is installed in the severe climatic conditions, it features frost protection design and devices. It is built on piles keeping space between the ground and the plant; its pipelines have special frost protection. New materials of construction ensure minimum weight of the plant and consequently minimum load on the ground. The loading/offloading assemblies of the plant are build outside on dedicated concrete foundations on piles for ensuring thermal stability of the perpetually frozen ground. The foundations are equipped with ramps for loading and offloading. The plant is controlled both manually and in automatic mode, not requiring personnel presence, which is important at the Far North region.